Franz looked out across the square from his first floor vantage point in the former office building mid-way along the East side. The snow flurries parted momentarily and he could clearly see the few remaining icicles adorning the statue in the central fountain. He also could also see movement along the enemy position at the far side of the square. Enemy troops had been moving in from side streets, from doors and cellars and were forming up for an attack. “Get ready lads!” he called out “But hold your fire till they are at the fountain”. A great cry rose up from the enemy ranks as the line charged forward; “hold it, hold it” Franz muttered to himself, “Fire!” he shouted as the enemy reached the trip line. The medium MGs opened up and were accompanied by a hail of bullets from the rest of his platoon. The right end of the line dissolved as the heavy machine guns raked the line. Then the line faltered, some of the enemy took shelter behind, and in, the fountain; some hesitated and stopped and then the line started falling back. “Cease fire!” Franz cried, no use spending ammo at a fleeing foe, but the noise of machine gun fire continued and the line of fleeing troops who dropped like wheat under a scythe. “Cease fire! !” he yelled again. It was then he realised the noise was not the steady purr of their own machine guns but the harsh rat-a-tat of the enemy DP28. A gust of wind opened a view to the far corner of the square where he saw the muzzle flash from a basement window and a group of security officers of the NKVD wearing their distinctive red epaulets. Fifteen minutes later the second wave started their attack, this time they did not falter, the possibility of death at the hands of the hated fascist invaders preferable to the certain death from the guns at their rear. He feared his platoon would be overrun as the wave closed when a loud “whoosh!” overhead and accompanying explosion at the centre of the square flattened the fountain and a large circle of the enemy around it. The promised tank support had arrived and just in the nick of time. He knew now that they would take the district but he also knew that the cost would be high. Finland & Army Norway: In the centre the German division continues to press forward eliminating a ski battalion. The Finns meanwhile eliminate another soviet stack close to the northern shores of Lake Lagoda and push the armoured battalion forward in the exploitation phase. AGN: No attacks all defensive. AGC. Very few attacks are launched but one is made against the North West corner of Moscow. The DR is converted to an EX due to fanatical resistance of the NKVD inspired defenders. The only consolation is that engineer support was not quite enough to gain a modifier and so no engineers are lost in the exchange. However 3 infantry divisions are cadred. 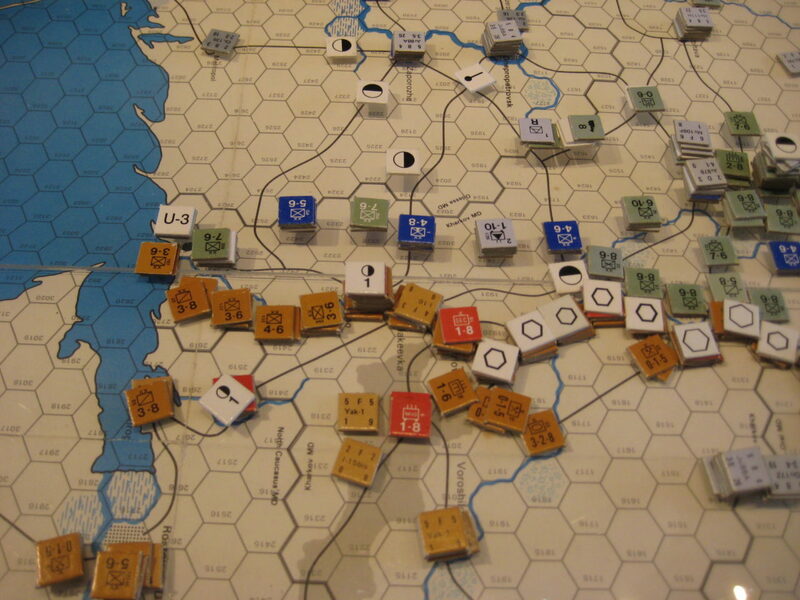 AGS: Kharkov falls to an engineer assisted assault and here a DE silences the defenders despite the NKVD presence. A second attack takes out part of the soviet attack force pressing the centre of the Axis line. Further south to the coast the Axis fall back a hex and adopts a “hedgehog” defence on alternate hexes taking advantage of the Soviets lack of exploitation ability and strengthening the points of resistance. 11th Army: Troops seal off the Kerch peninsular preventing reinforcements reaching the defenders and take Simferopol exploiting adjacent to the outer defences of Sevastopol. Air War: DAS is placed along the out of supply defenders in the Valdai. Moscow has been a no fly zone for the Luftwaffe due to the masses of soviet MIgs in the city but the capture of a second hex of the city and construction of airfields to the north allows the Germans to transfer hundreds of fighters to prove support and interdict soviet attempts to place DAS on the city defenders in the coming months. In the south a small raid against the black Sea fleet again fails to inflict any hits on the ships.